July 10, 2016 (JUBA) – South Sudanese government said it is in full control of the security situation in the national capital, Juba, after deadly clashes with opposition forces in and around the capital. Fighting erupted on Sunday morning between security forces loyal to President Salva Kiir and those loyal to First Vice President, Riek Machar. There were conflicting statements as to what caused the latest upsurge of violence, just a day after another deadly clash on Friday at the presidential palace. 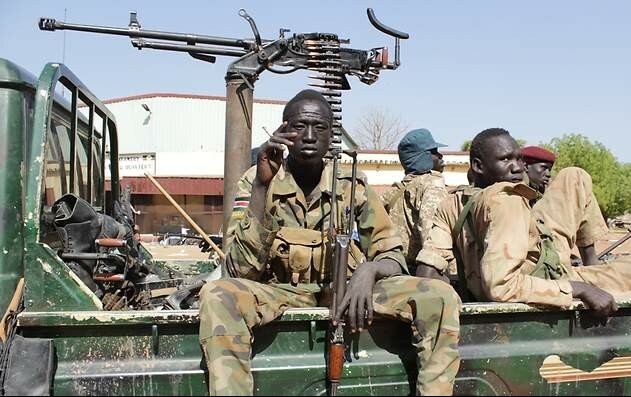 Minister of information and broadcasting, Michael Makuei Lueth, told reporters Juba that the fighting was started by Machar’s forces of the Sudan People’s Liberation Army in Opposition (SPLA-IO). He said the opposition forces attacked a check point where government forces have been stationed to “regulate traffic”, south of the capital near the camp of the SPLA-IO at Jebel Kujur area on Yei road. He said President Kiir’s forces then moved in and scattered the SPLA-IO forces at the check point, adding that some ran to the camp of the United Nations Mission in South Sudan (UNMISS) while others ran back to their base at Jebel. Lueth assured the residents in Juba that the government was in full control of the situation after crashing the opposition forces. “The situation is normal and it is under full control,” he assured. In a joint press conference he held with Taban Deng Gai, mining minister from the SPLM-IO, Lueth called for ceasefire between the two forces. “We have urged South Sudan’s leaders to operationalize the security arrangements in the agreement, particularly by establishing Joint Integrated Police units to patrol Juba, empowering the Joint Operations Center to ensure communication and coordination between forces in Juba, and directing the Joint Military Ceasefire Commission to operate continuously,” said State Department spokesperson John Kirby. Also the chairperson of the African Union (AU), Dr. Nkosazana Dlamini-Zuma requested the South Sudanese leaders, “working with the Joint Monitoring and Evaluation Commission (JMEC), chaired by H.E. Festus Mogae, former President of Botswana, to ensure scrupulous adherence to the transitional security arrangements”. The opposition faction of the SPLM-IO on their part said fighting had subsided on Sunday evening, but added that government forces continued to attack their positions throughout the day. “The situation is calm this evening unlike during the day when President Salva Kiir’s forces attacked our base many times,” Machar’s press secretary, James Gatdet Dak, told Sudan Tribune. He said SPLA-IO forces are in full control of their bases and the residence of the First Vice President, Riek Machar, including most of Gudele to the west of the town and north of Jebel Kujur. Dak also said the opposition forces did not carry out an offensive into the heart of the city, but were only fighting in self-defence to maintain control of their areas in minimizing escalation of the situation. If forces loyal to President Kiir will not attack again, he said, the situation may remain calm. Earlier, Dak explained that the fighting started in the morning when forces loyal to President Kiir attacked their base at Jebel Kujur, but were repulsed back into the town center.